Day 7 has been a good one! I was able to go to church this morning -- alone, unfortunately, due to our quarantine status -- and thoroughly enjoyed what was my last Sunday singing in the choir for some time. The Pastor's message was wonderful and left me with a new way to look at our current circumstances. The verses below (emphasis added) reminded me that I am in no way, shape or form responsible for the outcome of the hardships I am experiencing in my life. What a relief, right? This is all in God's hands. How foolish of me to ever think that I had some level of control or say in what happens to me or my family. He knows we are weak. It is only in Him that we find the strength we need to overcome the trials of life. Of course! I can vividly recall the helpless feeling I had as we handed over our 7-day-old son to the surgeon and his team for Chase's first life-saving open heart surgery on November 2, 2009. I've never felt more weak in my entire life than at that very moment. And yet, He was faithful! He sustained me, and He brought Chase through that difficult time. And as if that weren't enough, He did it all again 4 months later for his second heart surgery! God is faithful. His sustaining grace comes to us as we need it. Wow. Just what I needed, right when I needed it. Thanks be to God! I am so grateful for a renewed focus and filling of His spirit as we prepare for Chase's Fontan in just over a week. So of course church was great this morning, but I also enjoyed some family fun times, too! 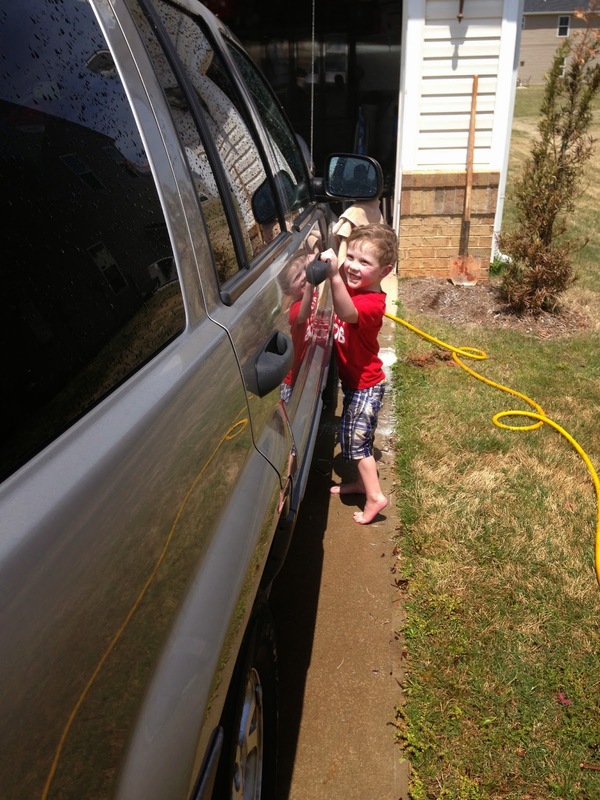 After lunch, the kids and I went outside to wash hubs' Jeep as this was something I knew we needed to do. The kids were actually super helpful! Give LO a bottle of Armor All and a cloth, then watch out! She knocked out the cleaning while I did the vacuuming. It wasn't long before the kids gave up on our chore and hit the playground across the street. But once I busted out the hose and bucket, they came running back! 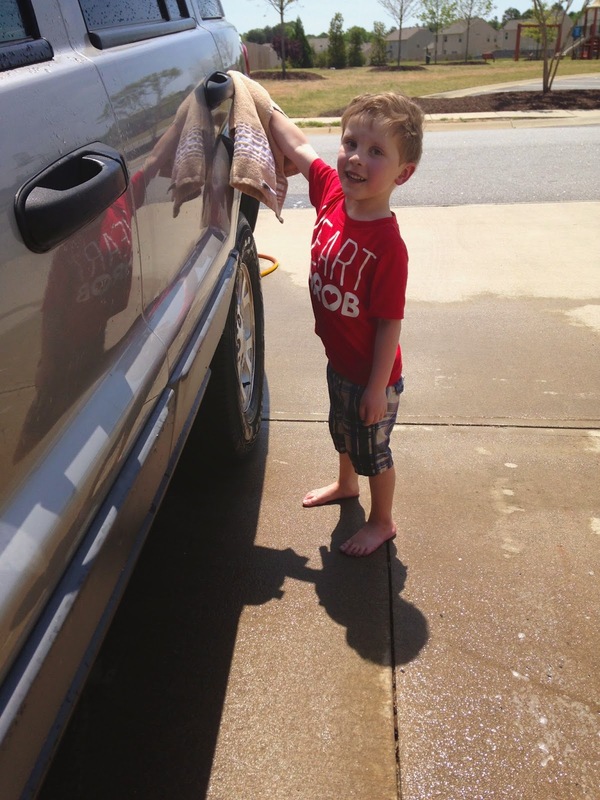 They were very "helpful" with the washing and rinsing, but Chase was a wizard with the drying! See? 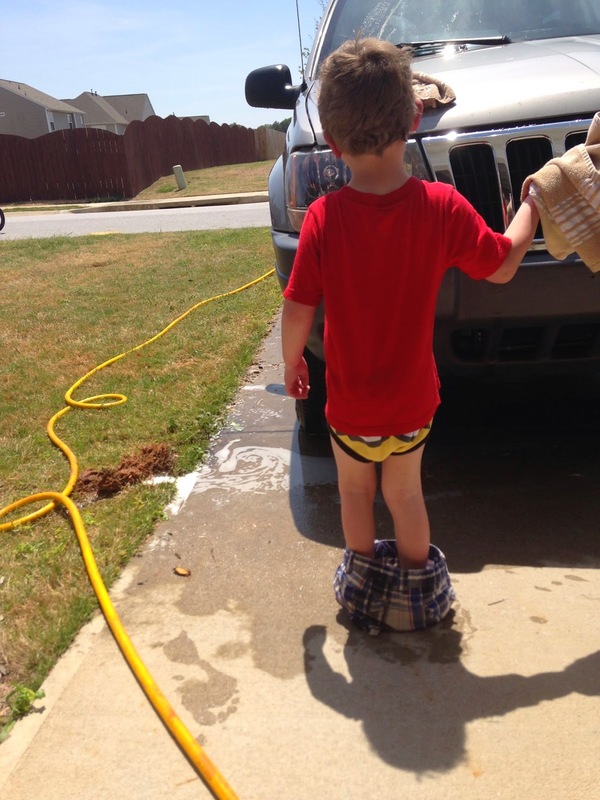 Please note the fact that his shorts are wet, heavy and falling down slightly. You'll understand why in a moment. Still helping---uh... wait. Something seems wrong here. Yes, that's a Minion you see peeking out beneath Chase's shirt. Silly boy! He sure was committed to his job! Haha! E joined us outside for a bit as well and enjoyed the fresh (albeit hot) air! 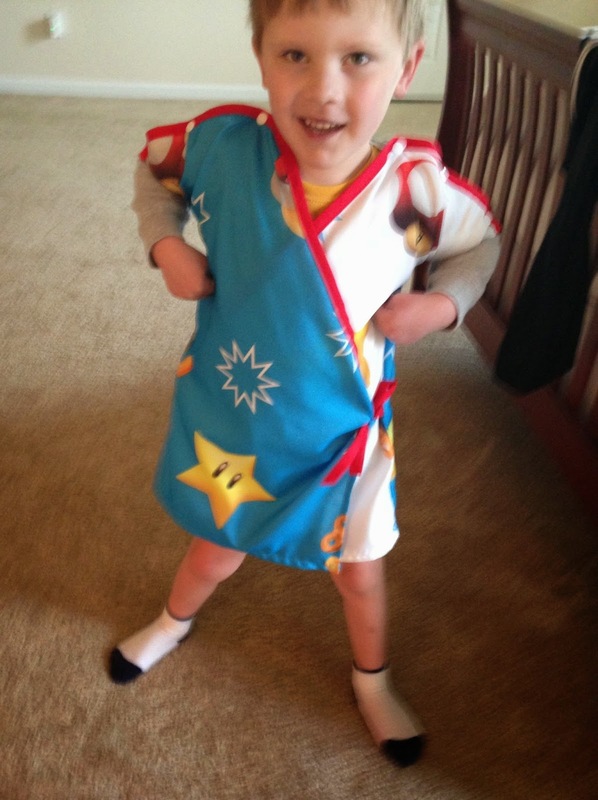 I was able to work on more sewing during nap time, and Chase approved the change to the length of his Super Mario hospital gown. He tried it on over his t-shirt and wore it for hours. Too cute! I'm also almost finished with his Mickey Mouse one, and have the materials for Toy Story and Despicable Me gowns if I find the time. We ended the day with a family movie and pizza, followed by homemade chocolate chunk cookies! It was a wonderful day! I'm so very thankful for God's message to me today and am so very blessed by my amazing family! Thanks a bunch to those of you who are following along with us. I figure some of the details may not be the most exciting blogging material, but I'm thankful to have this time in our lives documented to look back on in the future. 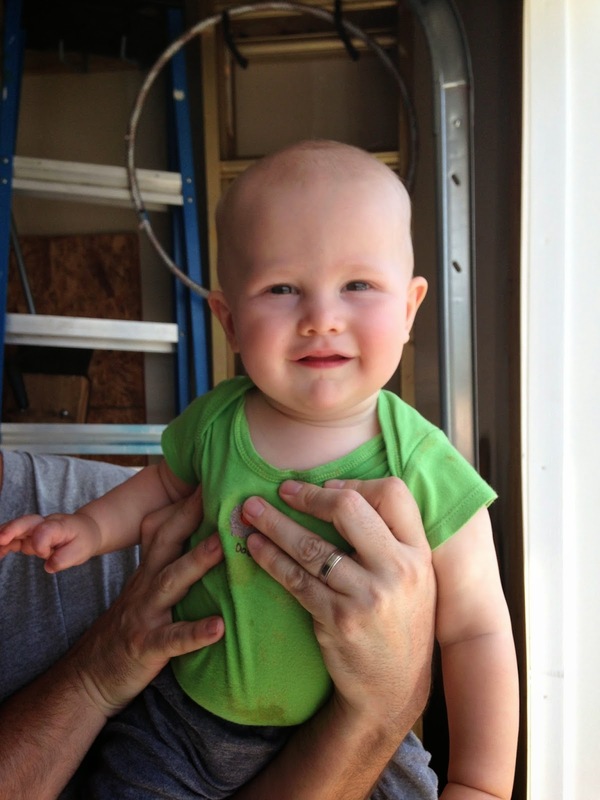 I'm so glad I have this blog to share Chase's journey with him when he's old enough to understand all of these details. He's been through so much and I couldn't be more blessed to walk this road by his side!